The MAP-based integrated multi-wavelength meter and high resolution optical spectrum analyzer module combines sub-GHz resolution performance and compact modularity in a single slot cassette. 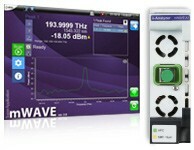 A richly featured multi-wavelength meter (MWAVE-A1) and high resolution optical spectrum analyzer (MHROSA-A1) with analysis features that can be controlled through an easy to use GUI or the MAP-200 automation interface, these modules are ideal for automated test in manufacturing environments. Based on coherent detection technology, they provide unprecedented frequency resolution to precisely report the power level and central frequencies of densely spaced optical signals as close as 2GHz. It is the ideal solution for both lab and manufacturing test systems where reliability, compactness and performance are critical.